In case you missed the news, Doki Doki Literature Club has been nominated for several award categories for IGN’s Best of 2017 Awards! Below is a list of the categories and how you can vote for DDLC. Voting ends December 19th. To vote, click on each of the above links to be taken to that category. On the page, scroll to the bottom of the games list, and you’ll find a poll. Simply select “Doki Doki Literature Club” and click on the “Vote” button. You can vote once for each of the four categories above. 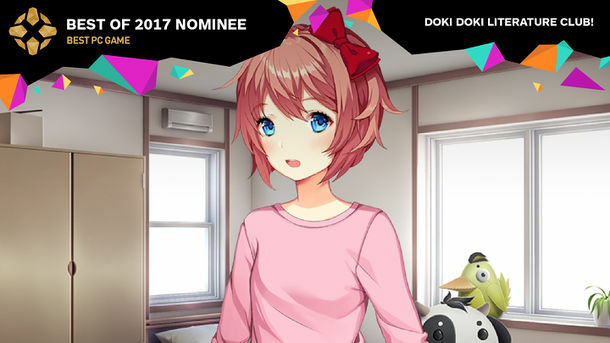 DDLC is nominated alongside some absolutely amazing games – I don’t blame you if you don’t want to vote for it in all of the categories. But I hope that you find it deserving of your vote for at least one of them. So thanks in advance, and let’s all see how many votes DDLC can get!